Safe, compact, portable design. Ideal for home, office or briefcase. Fully enclosed blades protect fingers. Automatically activates when envelope is inserted. Uses four AA batteries (not included). 2-7/8w x 3d x 1-3/4h. Shpg. wt. 1 lb. A stylish executive accessory, this 9" letter opener has a handsome rosewood handle and sleek stainless steel blade. Nickel-Plated carbon steel is strong and efficient for opening the most stubborn or delicate pieces of mail. Stainless steel blade for longer use. Accepts a 1-3/4" tall stack of standard-size business envelopes. Operates at a speed of up to 7,000 envelopes an hour. Automatically opens envelopes for easy one-hand operation. Fully enclosed blades protect fingers. Automatically activates when envelope is inserted. Cuts only one side of the envelope, leaving behind no scrap. 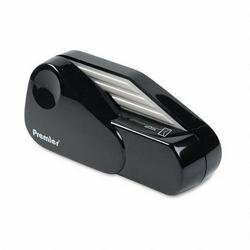 Automatically feeds and opens envelopes up to 1/4" thick. Opener accepts up to a 3" high stack of envelopes. Opens up to 12,000 envelopes per hour. 17w x 10d x 9h. Shpg. wt. 18 lbs. Fully covered safety blades operate only when in direct contact with envelope. Simply insert envelope into guide and its automatically fed through the cutters. Rubber suction feet. UL Listed. 10w x 8d x 5h. Shpg. wt. 3 lbs. 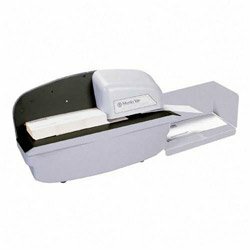 Simply insert an envelope into the guide and it is automatically fed through the cutter and opened. Built-In safety switch prevents operation when the cutter is not in direct contact with the envelope. Hardened steel cutter for long life.